Its a good job this is a virtual journey around the British Isles, because geographically my journey so far has not been logical. Starting in Sussex I have zipped up, down and across the country as the whim has taken me. For this post, as I am going down to the Woodfair at Bentley Wildfowl Museum at the weekend, I thought I would take a look at a woodsman craft and so are featuring the Bodgers of Buckinghamshire. To be strictly accurate they were the Bodgers of the Chilterns, which stretch over Oxfordshire, Buckinghamshire and Bedfordshire. The Bodgers of Buckinghamshire were woodsman who made the rungs, stretchers and legs of chairs to supply the local Windsor Chair industry in High Wycombe. 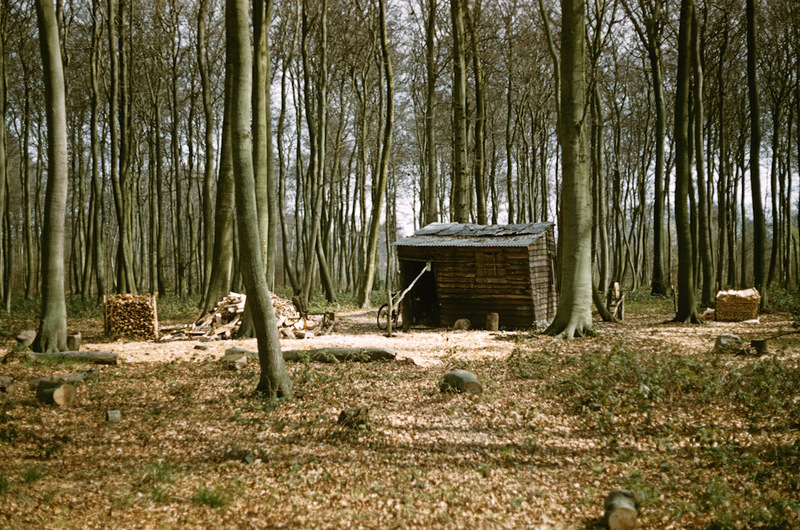 Traditionally, rather than transport the wood to a workshop bodger’s would work in the wood or forest, building a temporary structure to work under and using a foot powered pole lathe. Later some had their workshops at home. They weren’t, as it is sometimes reported, an itinerary band of men travelling from place to place, picking up work but rather their workshops could be said to be itinerant, moving around within the wood. 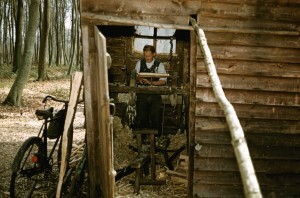 The bodger’s craft can be traced back over five hundred years. Stuart King has written a very interesting article on the last of the Buckinghamshire bodgers who clung on until the 1950s. Thankfully, there are still a handful of people who make a living from hand turning on a pole lathe but they don’t exist by bodging alone, which has gradually ceased to exist with the mechanisation of chair production. 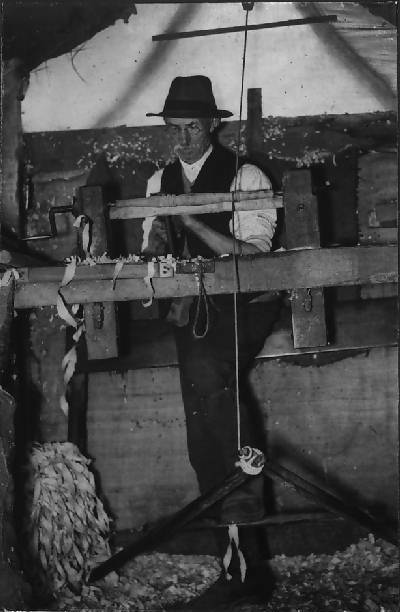 I have written another post on the origin of the word bodger, which has more details, if you are interested take a look. In the traditional craft world a bodger is a very specific term. Craftsman known as bodgers were highly skilled workers, originating in the Chilton’s in Buckinghamshire. Bodgers were pole lathe turners who worked in temporary workshops out in the woods; producing rungs, stretchers and legs for the local Windsor chair industry based in High Wycombe. The word bodger is an example of how, over time, meanings can change. It is also proof of how difficult it is to actually be sure of the origins of a word. Having spent quite a few hours trying to get to the bottom of the word I am none the wiser. I do know there has been many different uses of the word over the years. 1. A “bodger” was a travelling or merchant, referenced in Holinshed’s Chronicles of 1577. 2. “Bodge” derives from Middle English boccen, which means “to mend” or “patch” which shares this root word with the word “botch”. Samuel Pepys had his coat botched on Sunday 26th April 1663. 3. “Bodge” was a Black Country word which meant ‘to poke’ and a stick used to poke holes were known as bodgers. 4. A “bodge” was a unit of false measurement in the middle ages, Interestingly, I have seen reference to a Kent bodge which is similar to a Sussex trug and a trug was originally a unit of measurement. 5. Shakespeare uses the word “bodge” in Henry VI part 3 Act 1 Scene 4. If you look this phrase up in contemporary study guides, ‘bodged’ is said to mean ‘bungled’, but whilst trawling through google books I found an old Dictionary of the English Language which states that in Shakespearean terms bodge derives from boggle which means to hesitate. Now, if I crank my brain into gear and think really hard about the speech this quote comes from, I think the earlier definition might actually be right. Shakespeare seems to be describing the swan paddling away under the water but not going anywhere, thus it hesitates. Given all the different uses the term ‘bodge’ has had, it is no wonder there is confusion as to why chair part turners around High Wycombe became known as bodgers and confusion as to when they became know as such. Nowadays botch and bodge have very similar, but subtly different, meanings. A “bodge job” is an emergency repair done by a competent worker who lacks the correct tools for the job but has bodged it together until it can be mended properly. Whereas a ‘botch job” means a job that has been done very badly. A botcher is not someone who you would want to decorate your kitchen. This subtle difference is often lost and the words have become interchangeable, but it is still possible to see the link between these two words and the original bodge and botch – meaning to mend or patch. Though this meaning of bodge doesn’t really link to the Chair Bodgers. The bodgers were itinerant workers who travelled from place to place. It is now accepted the bodgers of the Chilterns were not itinerant workers but were local men with homes to go to at night who travelled to their workshops in the woods each day. I have found reference to itinerant bodgers, who travelled from town to town to provide a service to regional chair makers, but there were not many of these. 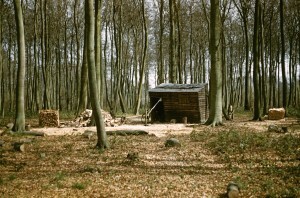 I sopose the bodger’s workshop could be said to be itinerant, being moved around the woods to where the timber was, thus providing a link to the original travelling merchant known as a Bodger. Bodges, were sacks of corn, closely resembling the packages of finished goods the bodgers carried when they left the forest or workshop. This has echoes of the old units of measurements, but sounds unlikely to me. Bodger was a corruption of badger, as similarly to the behaviour of a badger, the bodger dwelt in the woods and seldom emerged until evenings. How terribly romantic! According to what I have read, bodger’s didn’t go to their workshops until late morning when the dew had lifted, by which time all the badgers would be well tucked up in their sets. Bodger is a new word made up about 1910 by a journalist. There does seems to be a few discussions suggesting that bodger is a twentieth century term, but I am not sure about this. My searches on google books has revealed many books from the early twentieth century which describe the life’s of bodgers and various authors spend much time detailing how their trade has been past from father to son. In none of these books does the author mention the men have only recently become known as bodgers. Dorothy Hartley in her book Made in England, spends time discussing the origin of the word and she makes no mention of it being a recent invention. Also, in the book Country Relics, H. J. Massingham interviews various bodgers and again, does not says it was only recently they have become known as such. He describes the bodging career of a Mr Rockall who at the time, was 61 and had alway been a bodger. 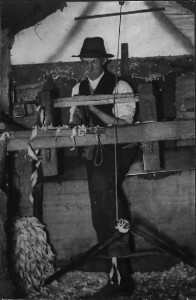 It is stated, he “lived as a boy at Little Marlow where the wood bodgers taught him the use of the pole lathe” (p.56 Country Relics, Massingham). This would put the term in use in the 1880′s at least. Bodger derives from the old french word ‘bouger’ – to move about. This is a suggestion put forward by Dorothy Hartley. I guess it’s a possibility, I will look into this one, but with so many possibilities within the English language it seems unlikely that the word would be plucked from another language. 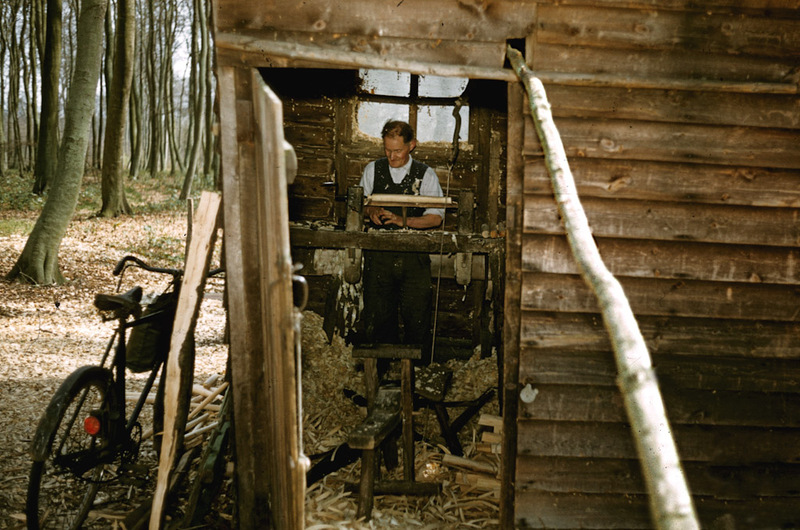 Bodger was a derogatory term used by the carpenters in High Wycombe who considered themselves better craftsmen than the chair part maker’s who worked in the woods. But this doesn’t really fit. If they were being derogatory then they would call them botcher’s. Maybe they called them bodger’s because they were craftsman but couldn’t complete the whole chair because they didn’t have the right tools in their workshops in the woods. This explanation would fit with the true meaning of the word bodge. I actually quite like this theory as it fits on more than one level and would explain why the term was applied just to the bodgers around High Wycombe. Finally and this one is my one suggestion which I have no idea if it is right, if a bodger was a stick used to poke holes then a bodger would bear a remarkable similarity to the sticks, rungs and legs made by the chair part turners. Maybe they were called bodgers because they made bodgers. Anyway after all this research, I still don’t really know how the Chair Bodgers of the Chilterns got their name. What I do know is the discussion is far from over. Bodger is now beginning to be the term used for all pole lathe workers, of whom there are but a few. Amongst themselves there is discussions as to whether they should call themselves green wood workers or allow the term bodger to be their collective name. If one was to be pedantic the chair bodger’s pole lathe differs from other woodworkers such as bowl turners, because the driving string is wrapped directly around the material to be turned and the lathe is not equipped with a chuck. So strictly speak the job title is defined by your equipment. However I must say that if I met a man in the woods wielding a big, sharp tool who said he was a bodger I would be inclined to agree with him, even if his lathe did have a chuck!